Alter The Press! : The Maine Announce New Album "Forever Halloween"
The Maine Announce New Album "Forever Halloween"
The Maine have announced their long-awaited new album is titled, Forever Halloween and will be released worldwide on June 4th via Eighty One Twenty Three in the US and independently via Rude Records in Europe, UK, Southeast Asia, Australia and Japan. The album, produced by Brendan Benson of The Raconteurs, will be the band’s second consecutive self-­funded release following their departure from Warner Bros. Records. A message from the band, as well as the artwork for Forever Halloween, can be found by clicking read more. "Hello Everyone! We are very excited to announce that our fourth studio album entitled "Forever Halloween" will be released on June 4th 2013. 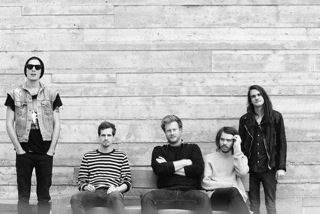 The record will be released independently in the US in partnership with our management company Eighty One Twenty Three. On Tuesday, April 16th, we will be launching the pre-order for Forever Halloween as well as a brand new song called "Happy" which will be available on Itunes worldwide. We want to thank all of you for the on going support in our music, without you, this record would not be possible. John, Jared, Garrett, Kennedy and Pat"